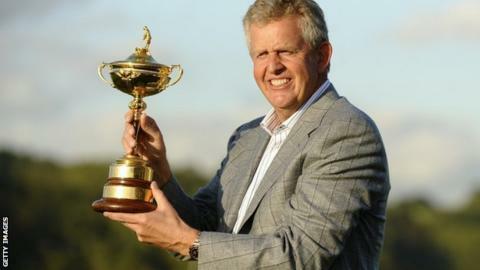 Former European captain Colin Montgomerie believes home advantage could be crucial for America in the Ryder Cup. Europe will start the defence of their title at the Medinah Country Club, near Chicago, on Friday. "It's difficult to win there. The last three Ryder Cups have been won by the home teams and I think home advantage is a big one," he said. "It could even be a tie, which would be great because we'd retain it." Montgomerie led Europe to victory in the last Ryder Cup at Celtic Manor in 2010 and has been succeeded by Spain's Jose Maria Olazabal, but considers the two teams for this year's event to be evenly matched. But the Scot also revealed that if he was still in charge he would not want world number one Rory McIlroy facing 14-time major winner Tiger Woods in the singles, despite Woods's less than impressive record in the event. Woods has only been on one winning Ryder Cup team - at Brookline in 1999 - but he has been part of seven winning Presidents Cup sides, where the USA take on an International side minus European players. "I would leave Woods well alone, don't go anywhere near him, especially in America and playing now, to a certain degree, an awful lot better than he has been," said Montgomerie. "I would want Rory to be playing someone else in the singles, if you don't mind. "The Presidents Cup just doesn't have it yet compared to the Ryder Cup and I think that they do perform better in the Presidents Cup because they don't have that fear of losing. "We don't have that fear and it's a positive for us. I think they have lost it because of that. "They don't perform to their ability in the Ryder Cup, although I think they're performing better since the FedEx series has continued into the week before [the Ryder Cup]."